With the start of playschool drawing near for Little C, I’m starting to think about packing snacks and how I can make them fun for her. I’m also working towards making snacks and lunches I pack “litterless”, so that we re-use as many packages as possible and make less waste. One of my first purchases towards our litterless school lunches and snacks this year were these Goodbyn Bynto boxes from Bumblebee Kids along with some reusable juice boxes. Next, I finally set up my sewing machines (the poor things have been in storage since we moved!) 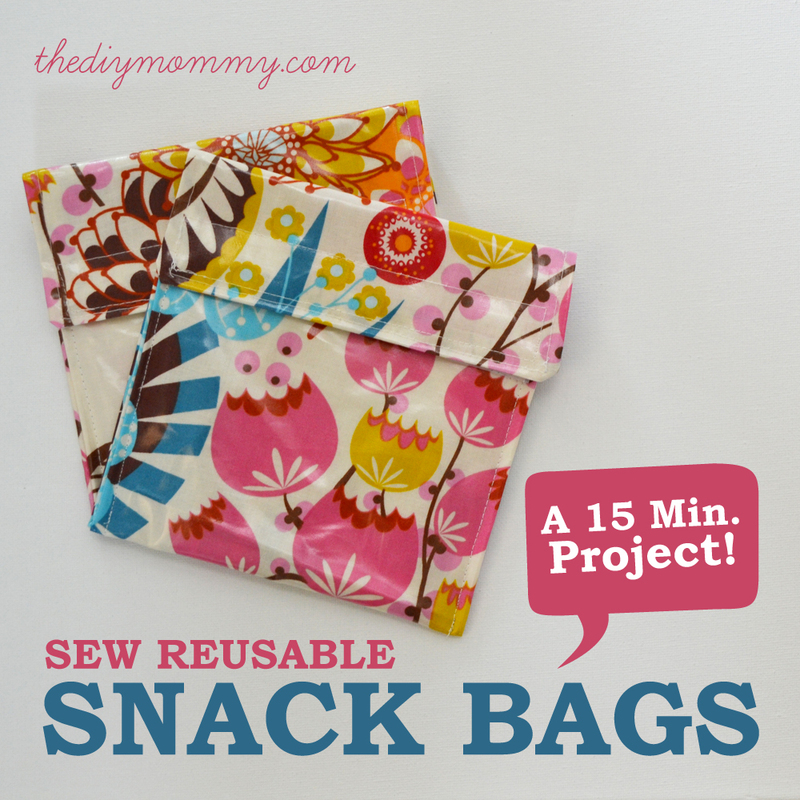 and set out to design a very simple reusable snack bag for things like sandwiches and crackers. I came up with an easy design that took me only 15 minutes to sew! These little DIY reusable snack bags are cute and they’ll be so functional for back-to-school snacks and lunches. **I realize that some people may prefer to use organic cottons or other fabrics near their food, so please choose a fabric that you’re comfortable with. Keep in mind that if your fabric does not have a “plasticky” coating, your food won’t stay as soft or crisp. I’ve researched laminated cotton and I’m comfortable with using it next to my food. It’s pthalate free and BPA free. 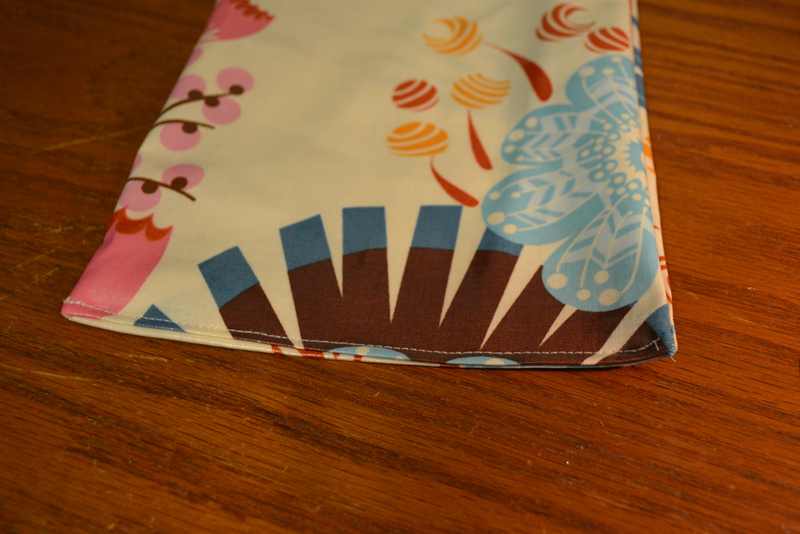 Cut out two rectangles of laminated cotton that measure 7 1/2 ” wide by 16 1/2″ long. I chose to cut my lining and outer fabric out of the same kind of fabric (laminated cotton), but you could make them each a different type of fabric if you choose. 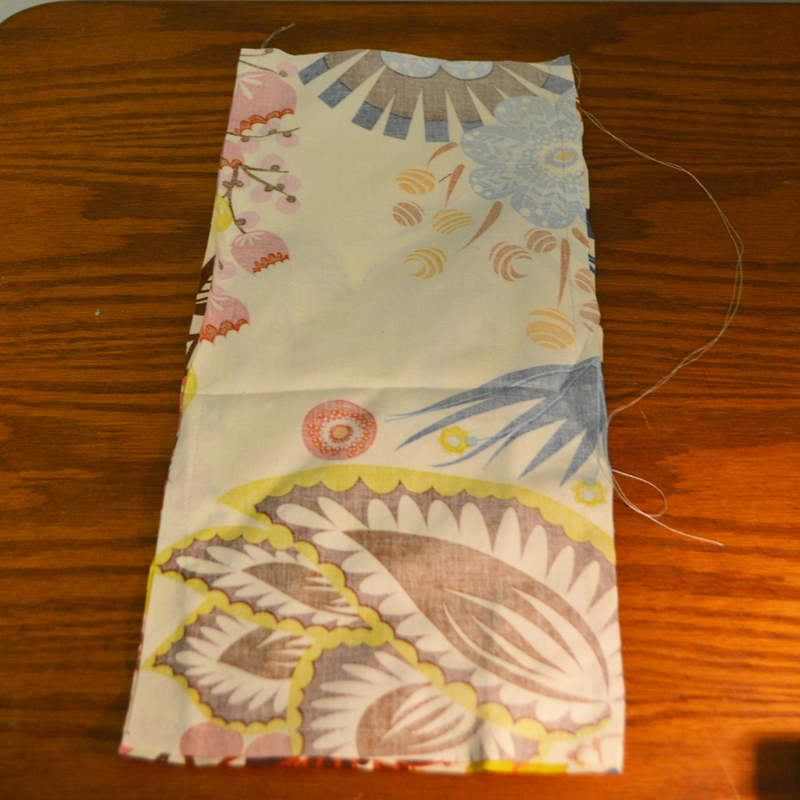 Place them right sides together and sew around three sides (using a 1/2″ seam allowance), leaving one short end open. 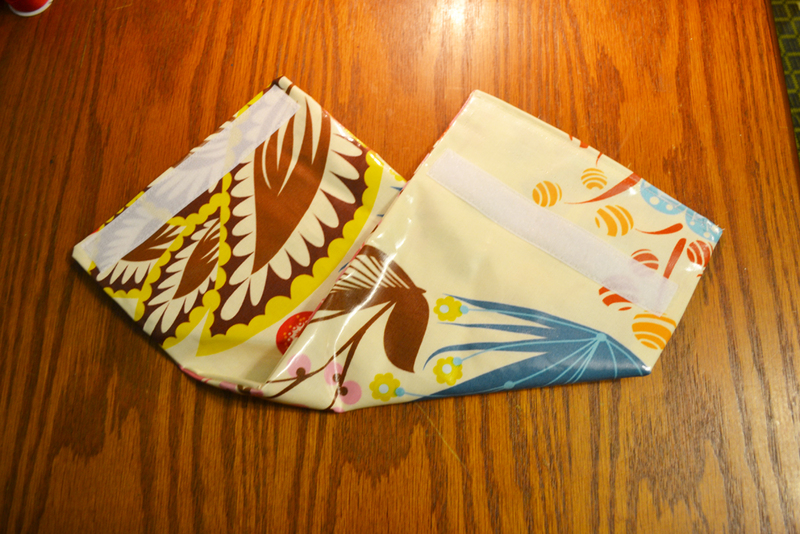 You can choose to keep the fabrics in place with paper clips as you sew (I just wing it!). Turn the rectangle right-side-out, and then fold the short edges in about 1/2″ and topstitch to close the remaining short end. Finger press around the perimeter of the rectagle (you can’t use an iron on laminated cotton). Cut a piece of velcro that’s about 6″ long, and sew the “hook” side to the top edge of your rectangle as shown (use the side without the topstitching) and the “loop” side to the opposite end of the rectangle (but place it on the back of the rectangle and about 2″ from the edge as shown). Fold the bottom edge up as shown, so that the bottom velcro is facing outward and its edge is about 2 1/2″ inches from the top edge as shown. Secure with paper clips if you wish, and then topstich around three sides of the snack bag, securing the sides and finishing the flap. Now, wasn’t that simple? 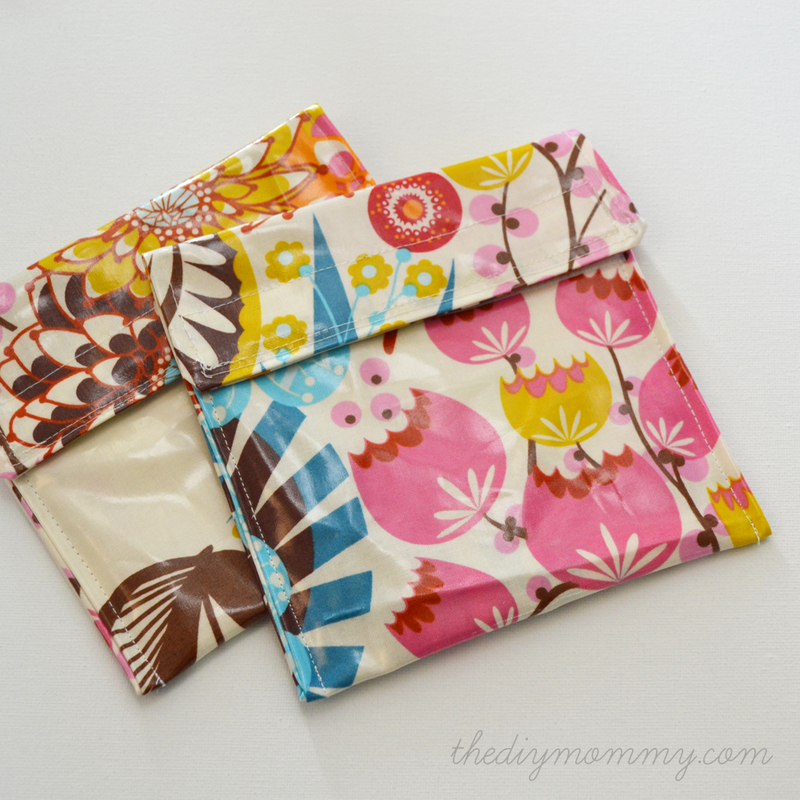 It’s a darling little reusable snack bag in a few easy steps and with minimal materials. I could make a ton of these (and I plan to)! Let me know how they work for you. 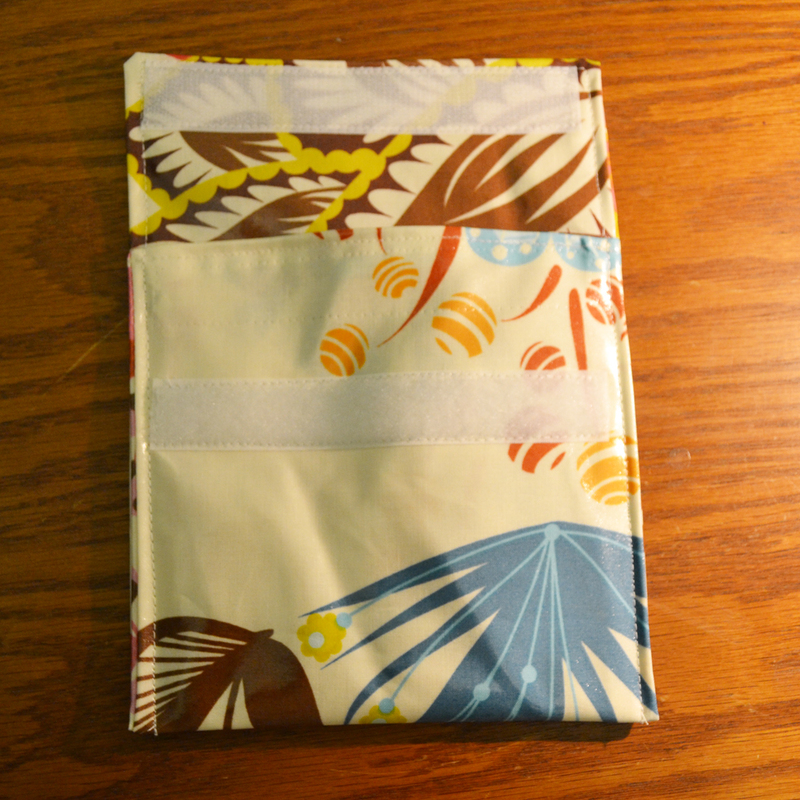 If you prefer a zippered snack bag over one with Velcro, have a look at my zippered wet bag tutorial and size it to your needs. Thanks, Judith! Yes, I love this fabic a lot. It’s so bright and cheery! Oh I am TOTALLY making my kiddos some!!! Thanks for the tutorial. so cute – love these! i have seen them in stores, but didn’t think about making them. Since this doesn’t require a sewing machine, I bet I could do it! The snack would stay in the bag better if you placed the Velcro on both edges instead of making a flap. OR, put one (or both) about a quarter of an inch from the edge so that there’s a piece to grip for opening ease. …and, if you round the bottom corners, you won’t have food crumbs stuck in the corners. Thanks so much for your ideas; they’re great! What are the washing instructions for these? Can you put them in the dishwasher or washing machine? What are the washing instructions? Can you put them in the washing machine or dishwasher? It would completely depend on what type of fabric you use (check the fabric manufacturer’s washing instructions), but the laminated cotton fabric I used here can be machine washed and dried. I usually machine wash, and then lay flat to dry. Great tutorial, I was able to make up a couple of them within an hour and put them with some snacks for a simple & useful birthday present. You were a lifesaver! That’s so great to hear! Thanks for visiting my blog! Do these hold sandwiches easily? Yes, they’re a great size for sandwiches! Just made four of these ]assembly line style for a white elephant! I used PUL as my liner and four different cottons for the outside. They turned out so cute! Thanks! Fantastic! Thanks so much for using my tutorial! I was wondering if you could share a hyper link to the material that you used to make these? I’m new to the sewing world and I want to make sure I buy a good material. Would someone be able to tell me what material exactly you used? Can you share a hyperlink perhaps? I’m new to the sewing world and want to make sure I buy the right material that can be machine washed, etc. Just ask at the fabric stores. I told them I was looking for laminated cotton and then explained what I was making and they knew exactly what I was talking about! The fabric stores, I went to two different ones, didn’t seem to know what I was talking about. They kept directing me towards oil cloth which is not the same thing (not BPA/Pthalate free). Looks like I’ll have to purchase this online. Do you know of any places to purchase this? I made quite a few of these today – I used Babyville Boutique brand PLU fabric that you can buy in packages of three (enough to make seven bags) or by the yard. It’s main use is cloth diapers and I got mine at JoAnn Fabric. Thanks for the tutorial. I’m using PUL and regular cotton. The PUL is new, but the cotton is repurposed. Hubby needs snack bags for his lunch box and making mine a little smaller, but you’re tutorial gave me the basic idea. thank you! If you are using the laminated cotton together with another non-laminated cotton print, which is supposed to be the lining? The laminated or the plain? I suppose you could use whichever one you’d like, but I’d prefer to use all laminated cotton to keep things easy to wash.
Could I use snap closures if I preferred? I don’t see why not! Things might fall out though if you’re putting smaller items inside. Where can I buy laminated cotton fabric? Great tutorial!! I just made one of these with the laminated fabric. The material really slides around, and you cannot pin it, but the paper clip idea was great. However, there is a bunch of air in it now!! Any other hints? Oh, I think I see what I did; I did not need to make a lining, but then you have the raw edges. I guess they do not fray, but I had made other bags with material and the waterproof lining, so I just did that with the laminated fabric and turned it inside out. Oh my, this is really easy, not to even have to do that!! Can you please tell me where to get the laminated cotton? Do you have a website that you use? The sewing mama and the green mama in me loves this idea! I get sad thinking about how many one time use plastic items we go through regularly. These little lunch item bags are perfect to solve this problem. 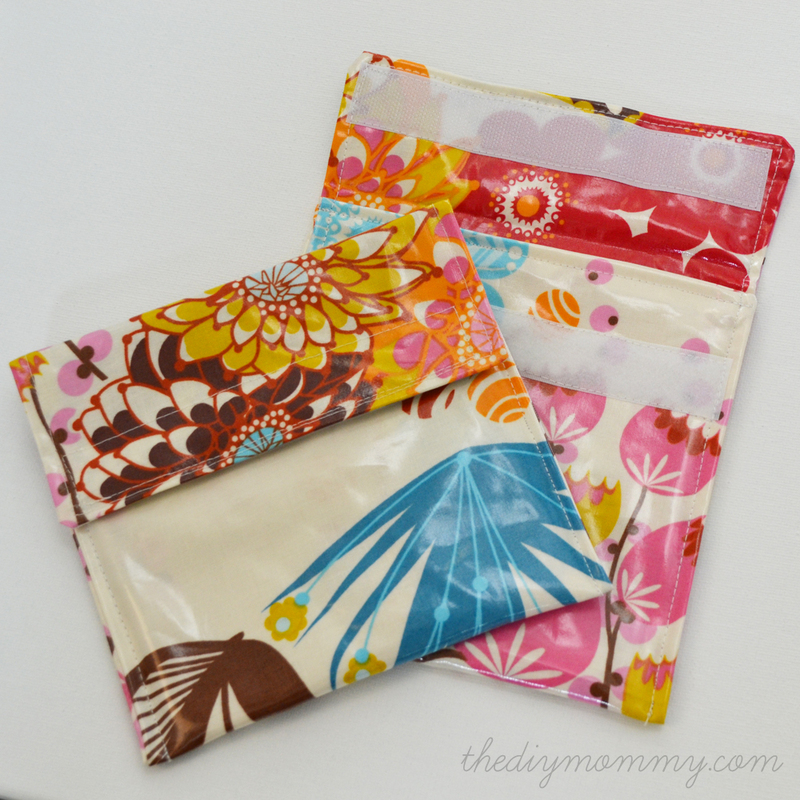 My daughter also just learned to sew a little better on her new kids sewing machine, so I’m going to have her help me sew some of these little bags for back to school lunches. we completely agree, its crazy how much waste we go through with school lunches. you will have a blast sewing these together with your daughter. My Ƅｒother recommеndeɗ I might like this blog. He was totally riɡht. This submit actually made my day. had spent foｒ this infօrmation! Thank you! Has anyone tried this with beeswax? Melting beeswax onto any fabric creates a handwash only foodsafe fabric but I wonder if it holds up well for this kind of project? Also has anyone tried the flip closure like you see on plastic snack bags that don’t have zippers? Can’t think of what they’re called.